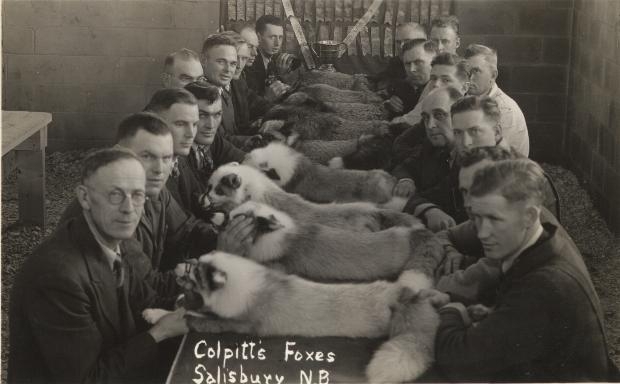 A group of men at a fox raising contest held in Salisbury. Fox farming was once an important industry in Albert County. In the early part of the twentieth century, before the beginning of the animal rights movement, clothes made out of animal skins were very popular. The first person to try fox farming in Albert County was Frank Steeves, he opened a fox farm in Upper Coverdale between 1910 and 1913. Several years later the Little River Silver Fox Company began operations after purchasing three silver foxes for a total of $15,000, a very large sum of money in those days. The company was so successful that soon other fox farming companies were started and individual farmers also began to raise foxes. In a few short years together all of these fox farms made up the largest group of fox ranches in the world. The largest of these farms and the largest fox farm in the Canada was the Colpitts Fox Ranch in Colpitts Settlement. In the 1920's, foxes cost between $500 and $1000 for a pair, and pelts could be sold for around $75 to $300 each. Silver Fox pelts were especially prized because of the unique silver markings on the pelts. At that time foxes were kept behind large fences which were sunk several feet into the ground to prevent the foxes from tunneling under the fence. Later the foxes were kept in rows of open air wire pens. Each of these ground level pens was ten feet long by ten feet wide by eight feet high and contained a wooden box which provided shelter for the foxes. Visitors were not allowed near the foxes because they are a shy and timid animal, and are naturally afraid of humans. World War II brought to an end fox farming in Albert County, because once the War started there was no longer a demand for furs. However, there have been a few attempts in recent years to try and revive the fox farming industry in the area. Silver Foxes were once in great demand because of the unique silver markings on the pelt of the fox.